What are the risk factors for subconjunctival hemorrhage? What are subconjunctival hemorrhage symptoms and signs? How do health care professionals diagnose a subconjunctival hemorrhage? What specialists treat a subconjunctival hemorrhage? Are there home remedies for a subconjunctival hemorrhage? What is the treatment for a subconjunctival hemorrhage? What are possible complications of a subconjunctival hemorrhage? What is the prognosis for subconjunctival hemorrhage? Is it possible to prevent a subconjunctival hemorrhage? The conjunctiva is the thin tissue that covers the sclera. It is the outermost protective coating of the eyeball. The wall of a small blood vessel within the conjunctiva may break spontaneously or from injury, causing a red area on the sclera, resulting in a subconjunctival hemorrhage. A subconjunctival hemorrhage appears as a bright red or dark red patch on the white of the eye. There are usually no symptoms associated with a subconjunctival hemorrhage. A subconjunctival hemorrhage is often first noticed by looking in the mirror or from another person saying that one's eye looks red. Diagnosis is made on the basis of the appearance of the hemorrhage and the absence of other findings. Most subconjunctival hemorrhages clear without treatment in one to two weeks. The conjunctiva is the clear tissue that covers the white of the eye (the sclera) and lines the inside of both eyelids. A subconjunctival hemorrhage is blood from a tiny broken blood vessel located between the conjunctiva and the underlying sclera. Most subconjunctival hemorrhages are spontaneous and not linked to any specific risk factors. If the hemorrhage is not spontaneous, then the risk factors for subconjunctival hemorrhage include trauma to the eye, eye surgery, the use of contact lenses, the use of medication that inhibits clotting or promotes bleeding, and diseases that are characterized by decreases in platelet count or vascular fragility. Because of the association between increasing vascular fragility and advanced age, being older also includes an increased risk of subconjunctival hemorrhage. Bright redness of the whites of the eyes can also occur when the tiny blood vessels covering the whites of the eyes rupture from trauma or changes in pressure within the head (for example, after forceful laughing or vomiting, when diving under water, or even bending upside down). While it is similar, this condition is called subconjunctival hemorrhage, and while it can appear frightening, it is generally harmless. 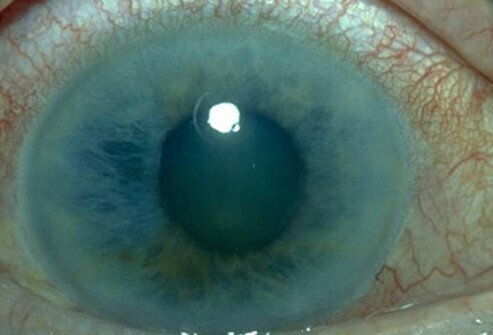 This condition is different from the inflammation of the conjunctiva seen with pinkeye. The conjunctiva contains nerves and many small blood vessels. These blood vessels are usually barely visible but become larger and more visible if the eye is inflamed. These blood vessels are somewhat fragile and their walls break easily, resulting in a subconjunctival hemorrhage (bleeding under the conjunctiva). A subconjunctival hemorrhage appears as a bright red or dark red patch on the sclera. Most subconjunctival hemorrhages are spontaneous without an obvious cause for the bleeding. The come from normal conjunctival blood vessels. Since most subconjunctival hemorrhages are painless, a person may discover a subconjunctival hemorrhage only by looking in the mirror. Many spontaneous subconjunctival hemorrhages are first noticed by another person seeing a red spot on the white of your eye. Rarely there may be an abnormally large or angulated blood vessel as the source of the hemorrhage. Subconjunctival hemorrhage can also be non-spontaneous and result from hemorrhagic conjunctivitis, a severe eye infection, trauma to the head or eye, or after cataract surgery, other eye surgery, or eyelid surgery. Most of the time, no symptoms are associated with a subconjunctival hemorrhage other than seeing blood over the white part of the eye or "blood in the whites of the eye." Very rarely people experience pain when the hemorrhage begins. When the bleeding first occurs, one may notice a sense of fullness in the eye or under the lid. Mild pressure around the eye may also be experienced. There is no associated headache. As the hemorrhage resolves, some people may feel very mild irritation of the eye or merely a sense of awareness of the eye. In a spontaneous subconjunctival hemorrhage, no blood will exit from the eye. If one blots the eye with a tissue, there should be no blood on the tissue. Call a primary care provider or ophthalmologist (a medical doctor who specializes in eye care and surgery) if the subconjunctival hemorrhage does not get better within two weeks or if it has happened multiple times. Also, call your health care provider if you have a hemorrhage in both eyes at the same time or if the subconjunctival hemorrhage coincides with a new onset of easy bruising or bleeding gums. a history of bleeding disorder. A health care provider will take a medical history and medication history to determine what events were leading up to the subconjunctival hemorrhage and will also perform an examination. Vital signs including blood pressure may also be checked. If trauma was the cause, a more thorough examination will usually be performed. In newborn infants, subconjunctival hemorrhage can occasionally be found as a result of the birth process. Your primary care provider or ophthalmologist can make the diagnosis. That physician can also order tests if you have a recent history of easy bruising. Because of the benign nature of most subconjunctival hemorrhage, there is no need for home remedies. Usually, no treatment is needed. Over-the-counter artificial tears can be applied to the eye if mild irritation is present. The eye does not require a patch. The use of aspirin or other medication that inhibits clotting should be avoided. If you are taking aspirin or an anticoagulant for a medical condition, check with your physician to determine whether the medication should be stopped or continued. Do not stop anti-coagulation medicines without physician consultation. These medications are frequently life savers, and they rarely need to be discontinued for a subconjunctival hemorrhage. If the subconjunctival hemorrhage is trauma-related, an ophthalmologist will determine what other treatment is necessary to promote healing of the injury. If the subconjunctival hemorrhage is a result of an external infection, an ophthalmologist may prescribe antibiotic drops or an ointment. This condition clears by itself within one to two weeks. Recovery is usually complete, without any long-term problems, similar to a mild bruise under the skin. Like a bruise, a subconjunctival hemorrhage changes colors (often red to orange to yellow) as it heals. A skin bruise changes to various shades of green, black, and blue as it heals, because the blood is being seen through skin. Because the conjunctiva is transparent, a subconjunctival hemorrhage never has these color characteristics. Very rarely, with recurrent subconjunctival hemorrhage in the same location in the same eye, there may be an abnormal fragile capillary within the conjunctiva that has thin walls and tends to bleed spontaneously. An ophthalmologist can identify such a condition and close this non-essential blood vessel using heat, either from a laser or a diathermy unit. A subconjunctival hemorrhage will not cause any complications unless it is associated with trauma to the eye or a recent history of easy bruising. The prognosis of subconjunctival hemorrhage is excellent when it occurs in the absence of trauma. It will spontaneously become smaller and disappear in less than two weeks. It will cause no scarring visual loss or other ocular changes. If you are having frequent subconjunctival hemorrhages or your subconjunctival hemorrhage is associated with easy bruising or bleeding elsewhere, you should have a medical evaluation for an underlying bleeding or clotting problem. Successful treatment of such an underlying condition may prevent future hemorrhages. Tarlan, B., and Kiratli H. "Subconjunctival hemorrhage: risk factors and potential indicators." Clin Ophthalmol 7 (2013): 1163-1170. What was the cause of your subconjunctival hemorrhage? What treatment did you receive for your subconjunctival hemorrhage? What were the symptoms and signs of your subconjunctival hemorrhage?